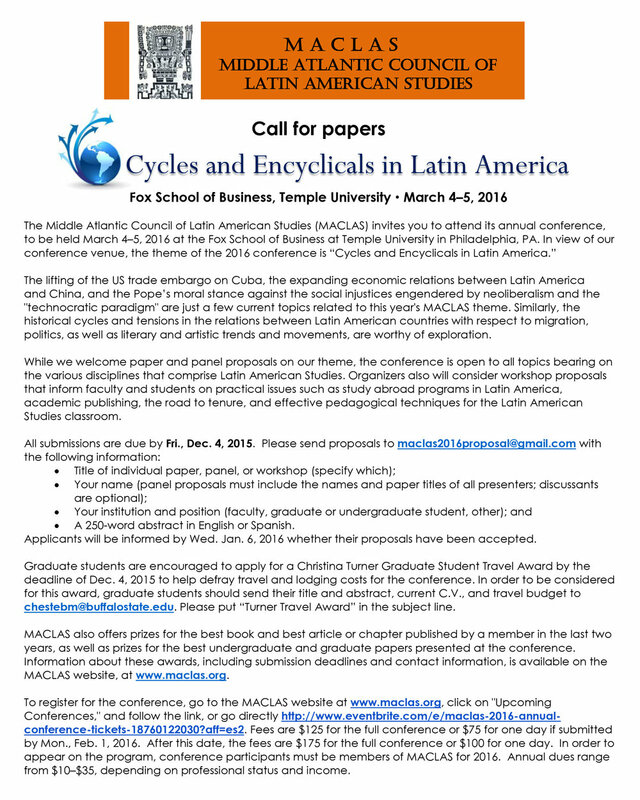 The final program for MACLAS 2016 can be accessed (PDF file) by clicking here: MACLAS 2016 Program. For a list of prize & award winners, see Prizes & Awards 2016. Mark Wasserman of Rutgers University accepts the 2016 Whitaker Prize for best book from María Roof. María Roof presents her Whitaker Address, "Politics, Piketty Poetry: Translation Matters". Kathy Cunniffe Peña introduces a panel on community-based approaches to celebrating Latin American culture in Philadelphia. Adriana Rincón, doctoral student in global governance and human security at the University of Massachusetts Boston, receives a Turner Travel Grant award from MACLAS President Meghan McInnis-Domínguez. Capoeira demonstration during a panel on community-based approaches to celebrating Latin American culture in Philadelphia.